The Gianni Ferrari Turbo Cruiser 4 mower is based on the Turbo 4 model but with the additional comfort of a cab. Cab is suspended on anti-vibration mountings and, due to the usage of electric and electro-hydraulic controls, there is no rigid mechanical linkage between the cab and the machine. Therefore the driver’s seat is completely insulated from the traction unit. The use of special mats provides further insulation. Thanks to all the above, the Turbo Cruiser cab ensures excellent ergonomics and comfort in any climatic situation. The revolutionary patented RCA™ collection deck, available in 130 and 150cm cutting width, has a large collection capacity that does not clog even when cutting long wet grass, giving a quality cut similar to that obtained with cylinder blades. The blades turn in the opposite direction compared to traditional mower decks. This rotation reversal has surprisingly positive results on cutting quality and collection efficiency. The mower deck combines all the latest safety features. At the front of the mower deck there is an opening edge higher than the blade cutting level. This difference in height prevents grass from being flattened, allowing the blades to cut precisely even with long grass. The deck conforms to all current safety standards by means of a moving flap that opens in areas of long grass and prevents any objects from being thrown out of the deck. This simple feature easily passes all the latest safety regulations. the double blades prevent the accumulation of grass and dirt in the upper part of the deck, always giving a perfect cut and collection. The floating action of the mower deck copes with the most difficult cutting conditions even on uneven surfaces (25 degree rakeback and 30 degree breakover). 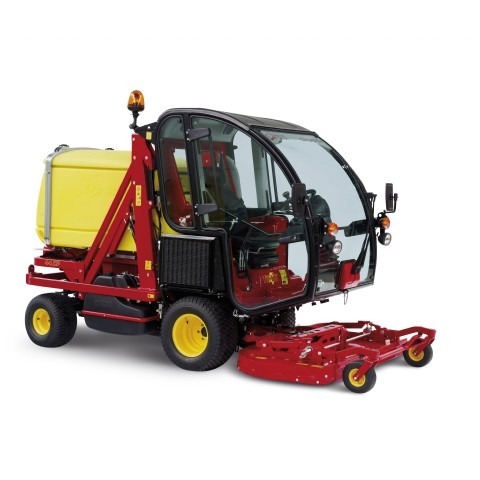 The hydraulic lift of the deck to the vertical position enables easy access to the underside of the mower deck, so that maintenance such as blade changing and cleaning are made easy. No manual lifting required. The machine can cut and collect grass, together with leaves, waste papers, tins, plastic bottles etc…, at a rate of 10.000 to 20.000 sq m/hour with perfect cutting and collecting quality. The exclusive cutting height adjustment is set by a single lever , very fast way and without any effort. The total time to vary the cutting height is less than 10 seconds. The intake duct connecting the front attachment to the fan is made of strong steel instead of plastic for long life. The powerful vacuum fan has a large diameter producing a high input of air at low rpm resulting in low noise level. The vacuum fan is equipped with 6 curved rotor blades that are easily changed in case of damage or wear. The collector is made of high strength polyethylene equipped with a filter, a self locking back door, a chute and buzzer warning when the container is full. The grass filter is composed of easily removable metal mesh with plastic protection reducing cleaning time. The rear door automatically opens when the collector is tipped. An efficient and strong hydraulic high-lift dump up to 220 cm (option) allows the operator to easily and rapidly discharge the cut grass directly into a truck or a trailer. All these features drastically reduce your cutting and tipping time. Two large disk brakes positioned on axle reduction gear case gives positive and safe braking even on steep slopes. Kubota 3 or 4 cylinder for maximum reliability, power and low noise level in full compliance with the last regulations. Since this is a highly professional machine, intended for extended use during day time, particular attention has been paid to the operator’s seat and control ergonomics to give the driver maximum comfort and safety. The controls for the engine, the blade engagement and the hydraulic devices (deck lift, collector emptying and lifting) are all located near the operator’s right hand and are all easily accessible. Warning lights and level gauges are located on the steering console arm. The tilt adjustable steering arm always allows the correct drive position to be achieved by the operator and it is extremely comfortable. Access to the seat is unhindered as there are no obstacles between the steering wheel, seat and foot-platform. The power steering has its own hydraulic pump that controls a double action steering ram and also acts as a connection bar to the steering hubs. The foot-platform is mounted on isomounts and is fully adjustable to the vertical position allowing the mower deck to be safely tilted via hydraulic power to vertical. The seat is adjustable in various positions for better comfort. 3 heights, full slide, adjustable back and armrests plus weight adjustment from 50 to 130 kg. If requested is available a heated seat model.